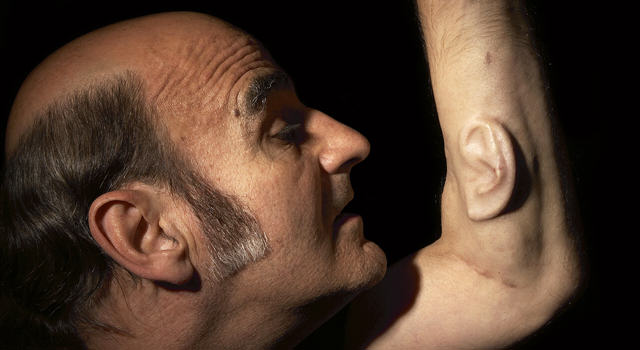 Austrailian performance artist Stelarc grew a third ear on his arm #ArtTuesday « Adafruit Industries – Makers, hackers, artists, designers and engineers! It’s gruesomely fascinating and strangely beautiful, but is an ear on an arm art? Stelarc, the award-winning Australian performance artist who has grown a third ear on his arm for art’s sake, believes it is. And as he pursues further surgeries to install a Wi-Fi connected microphone that will allow people anywhere in the world to listen to what he hears, he hopes he can convince others of his vision. Part surgical, part human, Stelarc’s ear was first constructed using a frame made out of biocompatible material that’s commonly used in plastic surgery. Once securely transplanted into his arm, the artist’s own tissue and blood vessels morphed with the material and the ear is now a living, feeling, functioning part of his body. Although it can’t yet hear, Stelarc now plans to use his own stem cells to develop a proper external ear lobe before implanting a Wi-Fi enabled microphone. Once connected, this microphone will be permanently activated so people across the globe will be able to ‘tune in’ to him 24 hours a day, seven days a week. “This ear is not for me, I’ve got two good ears to hear with. So wherever you are and wherever I am in the world you’ll be able to listen in to what my ear is hearing,” he said.